The Winogradsky Column Investigation Team reports. Where can high schoolscience teachers learn more about the growing interdisciplinary field ofAstrobiology? 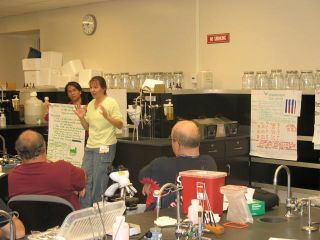 In the ASSET program, asummer institution for high school science teachers. U. S. teachers are invited to apply. ASSET is built upon thecontemporary thematic science standards based curriculum foundation, anddelivers an exciting professional development opportunity. ASSET alumnae notonly incorporate astrobiology into their classrooms, but also share theirenthusiasm for science and teaching with others. One teacher has described theexperience, "I can tell you how much I appreciate the intellectualismand knowledge I left with, not just notes from lectures of random facts. I leftSETI Institute feeling like I could have an intelligent conversation about allof the topics we discussed that week. So again, thank you for a fantasticprogram!" Participants will receive theentire Voyages Through Time curriculum and complementary astrobiologymaterials, developed by NASA's Astrobiology Institute, for use in theirclassrooms. Voyages Through Time (VTT) is a standards-based integratedhigh school science curriculum, delivered on CD-ROMs. VTT consists of sixmodules: Cosmic Evolution, Planetary Evolution, Origin of Life, Evolution ofLife, Hominid Evolution, and Evolution of Technology. Together thesemodules comprise a yearlong, integrated science course; or they may be usedindividually in discipline-specific courses. Each module includes a databaseactivity, an image library, videos, detailed lesson plans, and assessmentmaterials. Magazine-style Student Readers bring current science articles to theclassroom. To learn more about VTT visit http://www.voyagesthroughtime.org. Voyages Through Time was developed by the SETI Institute partnership with NASA Ames Research Center, the California Academy of Sciences, and San Francisco State University with major funding from the NSF (Grant IMD #9730693), NASA, Hewlett PackardCompany, Foundation for Microbiology, SETI Institute, and Educate America. VTT was successfully field-tested in 24 states with students in more than 80 highschool classrooms across the U.S.A.
ASSET is funded by the NASAAstrobiology Institute (NAI), the SETI Institute, Lockheed Martin Corporation,SETI Institute and Educate America. Participating teachers are funded fortravel and living expenses, materials, and subsequent outreachactivities. NAI conducts collaborative research and education on the originand evolution of life and the search for life beyond Earth. The SETI Instituteis one of the sixteen institutions across the U.S. that comprises the NAI. When are applications due?Applications are due February 15,2008.